Undine is the name of one of the most popular mermaids ever. She has a title role in a famous fairy tale and she managed to get a role in Star Trek too! Undine, a water spirit, who marries a knight to get a soul, just to be betrayed and became an Avenger, inspired hundreds of popular works since her story was published for the first time. She is a representative of a natural force, one of the first feminists and an ultimate femme fatale with significant red hair and many different superpowers. George MacDonald, Hans Christian Andersen, Paul Gauguin, Antonin Dvorak, and other important artists found it irresistible and her spell is today stronger as ever. Shall we spend a few minutes to learn more about her? Who was Undine? Why is her story so special? What is a mythology behind her name? Here are ten mind-boggling facts about Undine! Undine was first mentioned by Paracelsus who wrote an essay about four basic elements. He believed that each (water, earth, fire, air) is inhabited by specific spirits. Gnomes are the spirits of earth, sylphs of air, salamanders of fire and undines of water. When Friedrich de la Motte Fouque wrote a novella about Undine, he couldn’t possibly predict the success of the story, which was already pretty well-known. Undine is based on French myth about Melusine, which, on the other hand, shares many similarities with several Greek myths. While de la Motte Fouque left an impressive opus of fiction works almost everything is forgotten - except Undine (and among scholars maybe Sintram), of course. a revenge (by a mermaid). Written in 1811, the time of most painful defeats on the grounds of today’s Germany and biggest wins of Napoleon’s army, when people needed the highest possible dose of optimism, Undine offered to the audience exactly what people needed. In 1813 important battles against Napoleon in the territory of today’s Germany took place and de la Motte Fouque, an ex-soldier himself, actively participated with his writings. I have already written an article with a summary, some symbolism, and mythology about Undine. Here I would only point out how popular it was when it was first published. (By the way – this happened one year before the Household Tales by Brothers Grimm.) Undine addresses one of the most essential, most researched and yet still most secretive themes in the world – a relationship between a woman and a man. In this case, we are dealing with a strong woman and a weak man, what can be traced all the way to Adam and Eve, and is still present in numerous works of arts. It seems this situation attracts the attention of both genders and all age groups. One of the reasons is definitely the ability of women to give birth, what gives them an ultimate advantage on men, no matter how inferior was or still is the social status of women in different societies through history. It is very likely the reason why Undine and many other mermaids are so often portrayed with red hair. Red hair is associated with many stereotypes. Two of most often ones are that redheads are easily angered and extremely emotional and that their hair simply represents evil. The mix of literary elements in Undine (historical romance, gothic horror, fantasy, religious allegory) attracted artists from all cultural spheres. Musicians, dramatists, choreographers, and others extensively used Undine as a source of inspiration as well. 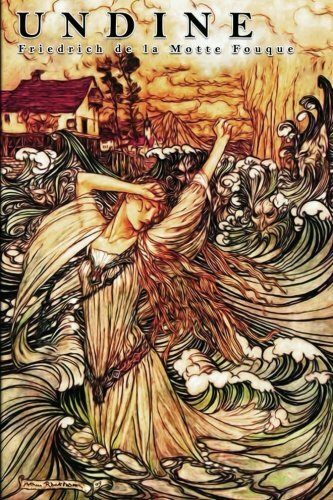 Maurice Ravel’s Gaspard de la Nuit is inspired by an Aloysius Bertrand’s poem Ondine. Maurice Maeterlinck and Jean Giraudoux wrote plays, Antonin Dvorak, Piotr Ilyich Tchaikovsky, Albert Lortzing and E.T.A Hoffmann made operas, Cesare Pugni, and Hans Werner Henze composed music for ballets, all heavily built on de la Motte Fouque’s work. Her spell is very much alive even today. Andy Warhol (The Loves of Ondine) and Neil Jordan (Ondine) filmed movies about her. A race of extra-galactic beings in Star Trek saga is called The Undine, what is also a name of the popular steampunk online game. As a fusion of several myths Fouque’s Undine was not intended for children. Yet after a few years first simplified, shortened versions became to appear in German and other languages. Some of them were illustrated. While we still can’t put de la Motte Fouque’s book in the category of stories for kids, several authors adapted Undine for children. This was only a beginning. Many wrote new stories with different twists based on the same idea. The most well-known fairy tale based on Undine is indisputably Andersen’s Little Mermaid. Greatest storyteller ever used it as a backbone of his own personal view on unrequited love. A detailed process of making The Little Mermaid can be read in his letters to his friends, including Andersen’s decision for the educational ending, which is probably not only the weakest part of this otherwise very successful and popular fairy tale but one of the worst parts of complete Andersen’s opus. Oscar Wilde made a very interesting twist of the same plot (quest for the immortal soul) in his Fisherman and His Soul. His focus is not on the woman who gains a soul, but on the man who loses it. Are you familiar with Andersen's Little Mermaid? 1. Yes, but I don't really like it. 2. Yes, one of my favorites. 3. Andersen's? You mean Disney's? 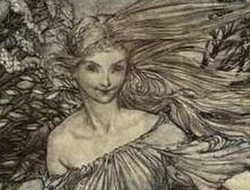 An author had seen many adaptations of Undine during his lifetime. Several important ones made himself too. When, for instance, he wrote a libretto for E. T. A. Hoffmann’s opera (titled Undine), he changed the scene with Father Heilmann and Undine’s foster-father who defy Kuhleborn, Undine’s uncle and protector, with a strength of their Christian faith, while in the same scene in the book Kuhleborn completely controlled the situation. We can find numerous symbolic elements in Undine. They are present on very different levels. There is, of course, color blue, a color which symbolizes Undine’s ’out of this world’ character but also the color of heaven where she is trying to get but needs to get a human soul first. There is also water, a symbol of transformation with always changing shape (as Undine changes through the story), but an ability to transform everything coming in contact with it as well (like Huldebrand and most of the other characters change after interaction with Undine). Have you already read Undine? Thanks, Mira, for your comment. Undine by de la Motte Fouque is definitely a classic read. It's especially interesting to compare it with Andersen's Little Mermaid. I saw Jean Giraudoux's play Ondine a long time ago, and really enjoyed it. Now you have inspired me to read the play as well as some of the other works about Ondine/Undine that you mention. I have read several fairytales about water spirits like Undine, and I think the symbolism is worth exploring. Hans Christian Andersen is famous author of fairy tales. Less known are similarities of his life with his fairy tales. First thought about Oscar Wilde is probably not related to women. Yet several ladies heavily influenced his life and career.